In the big race up in the 10th Congressional District on the North Shore, this is a big endorsement for Bob Dold and his campaign against Congressman Brad Schneider. But the reality is this: When Dold held the office, he maintained the district's tradition of independent representation, with a voting record that was one of the most bipartisan in Congress. In the two years that Schneider has held office, he has not. His voting record is considerably more party line, as a comparative review of The Washington Post's Congress Votes Database indicates. And unlike Rep. Tammy Duckworth, also a first-term Democrat in a neighboring district, he has not sought to forge the across-the-aisle relationships that can make him truly effective, particularly given his party's minority status in the House. Voters have a difficult choice between two capable candidates, but only one of these two candidates carries on the dynamic independent tradition of Mark Kirk and John Porter. 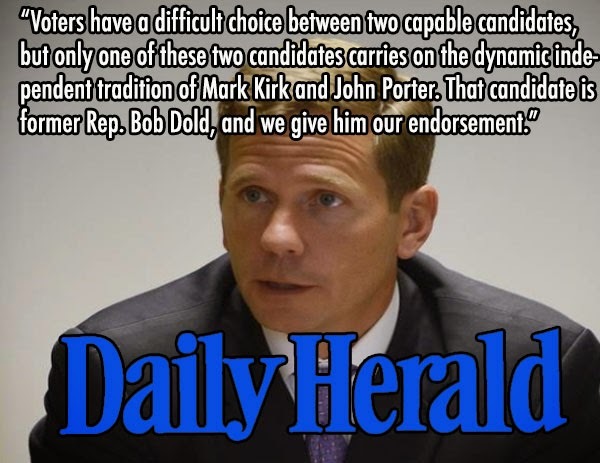 That candidate is former Rep. Bob Dold, and we give him our endorsement.